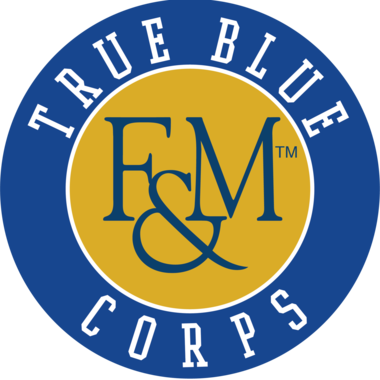 True Blue Corps is more than just a way to contribute to Franklin & Marshall; it is an approach to your daily life. Are you informed, involved and invested in the College? Click the button below to commit yourself to the True Blue Corps. Be an Advocate. Be True Blue. Begun by the Alumni Association Board in 2014, the True Blue Corps (TBC) promotes life-long engagement with the College by fostering a spirit of pride and a shared sense of history and tradition. As advocates and volunteers for the College, TBC members give of their time and treasure. Members of TBC actively support the College’s recruiting efforts, fundraising, community-building initiatives and educational mission. They stay informed; they are able to speak about College priorities within their communities and are invested in the College’s future. They are energetic, engaged advocates for F&M who wear the College on their sleeves. We have more than 27,500 living alumni. Let’s get them all involved! Commit to passing on your passion for F&M and be part of a group that is already engaged. To get involved or learn more, contact Director of Alumni and Volunteer Engagement Donna Pflum at dpflum@fandm.edu or 717-358-4266. Have a cup of coffee with other alumni in your area. Submit a class note to the Franklin & Marshall Magazine. Wear an F&M T-shirt or hat to the gym or supermarket. Take a current student out to lunch when they are home over winter, spring or summer break. Call or email a classmate whom you haven't spoken to in awhile. Visit campus with your family to see all the new and exciting things happening at F&M. Make your annual gift to F&M between July 1 and June 30. Watch Common Hour live or in the archives on the F&M website. Attend a regional event in your area and invite two friends to join you. Read about F&M in the News. Watch a live stream of an F&M sporting event. Post a status update on your class Class Facebook page or join one of F&M's LinkedIn groups. Launch a Diplomat by referring a current student to a job shadow, internship, or job opportunity; answering industry-specific questions; presenting a workshop or webinar on a life skill. Hire a Diplomat! Visit this page to find out how you can recruit on campus or post a job opportunity.